Ghana is blessed with hundreds of miles of pristine coastline and the country's beaches are some of its greatest attractions. Some of the best beaches can be found at Busua and Dixcove, two rustic fishing villages conveniently close to Accra. The beaches are long and sandy, great for walking and swimming and sometimes even suitable for some decent surfing. 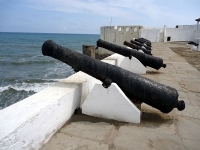 The Ghanaian coastline is also notable for the historic colonial forts that dot its shores, reminders of the region's onetime importance as an outpost in the slave trade. Nowhere is this more evident than in the former British colonial capital of Cape Coast, a now flourishing modern town which was once the largest slave trading centre in West Africa and contains the massive Cape Coast Castle. The first lodge built on the site was erected by Swedish traders in 1653. The Cape Castle and its spooky dungeons, where thousands of slaves were locked away in terrible conditions, were restored in the 1920s and are now a UNESCO-listed tourist attraction. The castle houses a moving museum detailing its brutal history. Eleven of the colonial forts and outposts in Ghana have been declared UNESCO World Heritage Sites, including Fort Coenraadsburg and Elmina Castle in Elmina, Fort Metal Cross in Dixcove, and Fort Amsterdam in Kormantin. Tourists exploring the coast can therefore enjoy stunning equatorial beaches as well as some fascinating historical sightseeing.